Tag line: "Three friends. Twelve Turbulent Years. And One Day We All Must Face"
On the surface, Big Wednesday may look like a surfing movie about a group of buddies who spend their days catching waves and going to parties. But it’s something much more substantial than that: it’s a well-realized coming-of-age tale set against the backdrop of the turbulent 1960’s, and its story of friendship remains as poignant today as it was in 1978. 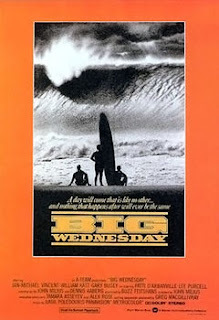 Big Wednesday follows three surfers: Matt Johnson (Jan-Michael Vincent), Jack Barlow (William Katt), and Leroy Smith (Gary Busey), throughout the 1960s and into the ‘70s, when their carefree lives were turned upside-down by war and the inevitability of growing older. Yet no matter what direction life pulled them in, they always had the ocean and their surfboards to bring them together again. Writer / director John Milius was himself a surfer (Big Wednesday is semi-autobiographical in nature), and because it’s such a vital component of the story, the film’s surfing sequences have an almost epic feel to them. Several times during the course of the movie, a narrator (looking back from an unknown point in the future) reviews the various big swells that hit the area over the years, talking about each one with a sort of reverence, as if he was a poet describing some great event. These scenes are punctuated by Basil Poledouris’s often majestic score, and most of the surf footage comes courtesy of filmmaker Greg MacGillivray, who in the past few decades has produced a number of award-winning IMAX documentaries (The Living Sea, Coral Reef Adventure). In addition, the character of Bear, played by Sam Melville, is treated like a beachfront guru, telling grand stories about the ocean that make surfing sound like a religious experience. He is someone the others admire, and even when life slaps him down (a failed business, etc), Bear never loses the younger generation’s respect. For him and everyone else in Big Wednesday, surfing is much more than a sport; it’s a way of life, a state of mind, and the force that keeps their relationships strong. Yet as integral as surfing is to Big Wednesday, what you will remember are its characters, and how their friendship survived the test of time. Played by Jan-Michael Vincent, Matt Johnson is, at the start of the film, a surf legend, the guy the kids all look up to. But he’s also an alcoholic. Not even marriage to his longtime girlfriend Peggy (Lee Purcell) nor the birth of his daughter can straighten him out. Then, one afternoon, his carelessness causes a bad accident on the highway, and only then does he begin to realize how self-destructive he’s become. William Katt’s Jack also has his share of life experiences, including a long-term relationship with Sally (Patti D’Arbanville), a waitress at the local diner; and a tour of duty in Vietnam. As for Leroy (the always fun Gary Busey), whose nickname is “The Masochist”, he remains crazy through much of the movie (it was Leroy who devised the plan that kept him and Matt out of the army, and their antics at the induction center are a definite highlight). But of the three, it’s Matt who undergoes the biggest change, and even though he’s a different person at the end of the film than he was at the beginning, the bond between him and his two best friends seldom wavers. It’s unfortunate that Big Wednesday failed so miserably at the box office (after bringing in a meager $4 million or so, it disappeared from theaters). It’s a remarkably touching film about a bygone era, featuring a trio of buddies who saw the best and worst of what the ‘60s had to offer, and came through it together. Interesting cast. I'm sure I can find this one on streaming video. I'll give it a look.